Again, I promise I won’t make this blog all-implant, all-the-time, but I am going to track the major events. In a few hours I will my minus two front teeth. I’m going out for a nice breakfast and then I’m heading over to the NYU Dental School. Luckily, last night at my monthly MBSR meeting there were two people there who use the NYU Dental School as well. One of them also had a friend who recently completed the implant process there. Everyone was raving about how good the care is, and the person who had the implant is thrilled with the result. So, there’s that. I’m sorry I didn’t get more practice of the Verdi Requiem in (the piece the Choral Society is doing in the spring), because I don’t know what shape I’ll be in for the new few days. But here goes. If I’m not a sobbing mess I’ll post an update later today. I don’t have a new picture for today, so this is from New Year’s Eve. I’m going to pretend those are good luck balloons for me. That just gave me a nice movie scene idea! I tend to walk the same routes for various places. 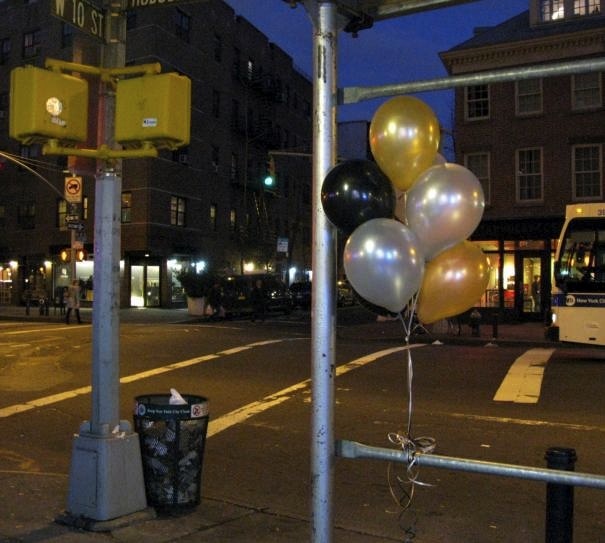 In a movie, if one character wanted to do something nice for another, they could lines the streets that they know the person is going to walk down with balloons. For instance, it would have felt fantastic if all the way to the Dental School, there were balloons tied here and there along my route. Would that make a sweet movie scene? I am saying prayers for you. You will do just fine and it WILL BE OVER!! To Buddy and Finney: Take good care of your mom!